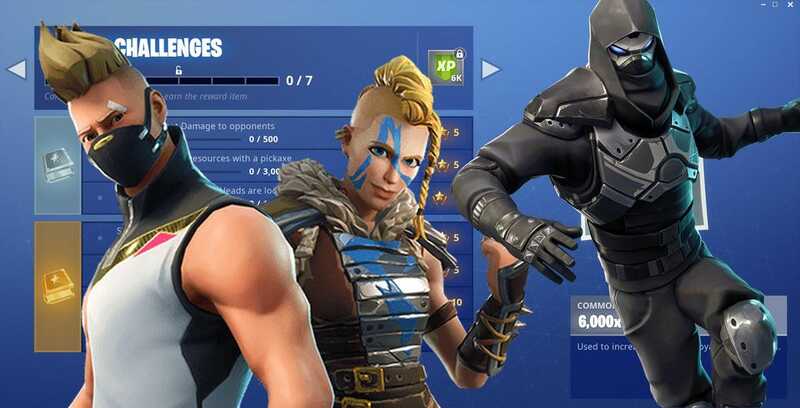 Week 7 of season 5 has arrived in Fortnite at last, and you’re going to want to complete this week’s challenges as soon as possible in order to secure yourself that baller new Enforcer Road Trip skin with his riot shield back bling which just might be about the coolest thing in the game. Many of the challenges are familiar this week, but there’s at least one significant change to one of the challenges people hate that you should be aware of. So, what do we have this week, then? I really don’t like the “reach the center of named locations” challenge because it’s pretty boring and easy. We may have a guide for the “optimal” route to take to get all four of these, but obviously it can be storm-dependent. Once you get to the center you’ll hear a giant sound effect to let you know you’re center enough, so don’t worry about missing it. 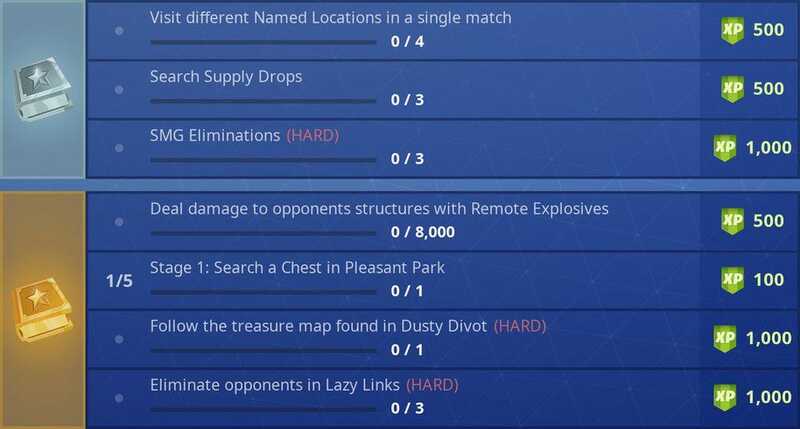 Oh, and since the last time we had one of these, the challenges now also pop up onscreen when completed, so that also helps. Supply drops are everywhere so this should not take you too long, I imagine. SMGs may have gotten nerfed a bit recently, but they’re still super strong, so I would not think that three kills with them is going to be a problem. That is a lot of damage to deal with remote explosives so this may take some time. You might not even be able to find C4 to fill this requirement for a while, but once you do, take on the biggest player-made structure you can find and go nuts. You’ll rack up that several thousand damage soon enough. Blow them up in Lazy Links and you’ll work toward that challenge too. But now we arrive at the one change to a challenge this week, the fact that the treasure chests quest is now a multi-stage affair. Why? Because I think most people hated landing the same spot over and over again to hunt down chests that everyone else was also after that week, so what Epic has done has made it into a scavenger hunt across multiple locations. 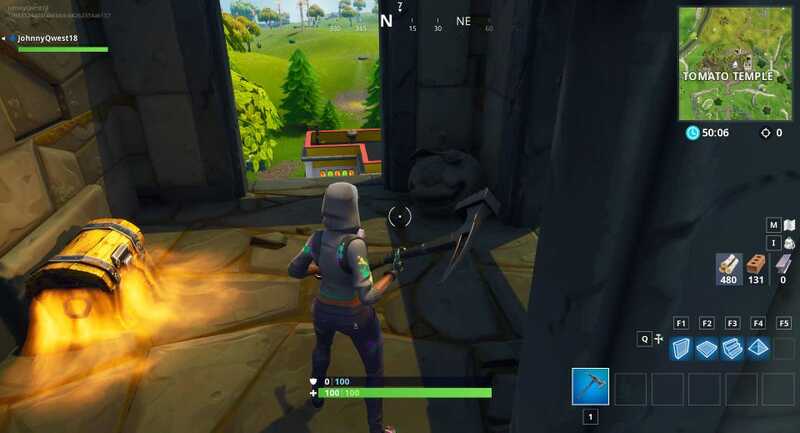 The first location is Pleasant Park, but after that, there are six more steps taking you to different locations for each of them, and you should only need one per location. This should help solve the annoyance of being forced to go the same spot a million times, and I like the idea. I believe they might be applying this to eliminations in different locations next week too, but we’ll have to see. Happy challenge hunting, and I’ll update this post if anything ends up tweaked or changed. Is this the real life woman in black ghost haunting a library?